One of the drawbacks to being a great educator (like you!) is that people seem to think you’re an idea-generating machine. You are creative and innovative and you do amazing things in your classroom – people around you take notice! But then they want you to ALWAYS be creating these incredible ideas. No pressure, right? Sometimes when we feel the stress of trying to come up with new ideas or ways of working through a problem, we can get stuck. It’s as though our mind knows we are expected to perform, so it just shuts down and we draw a big blank. 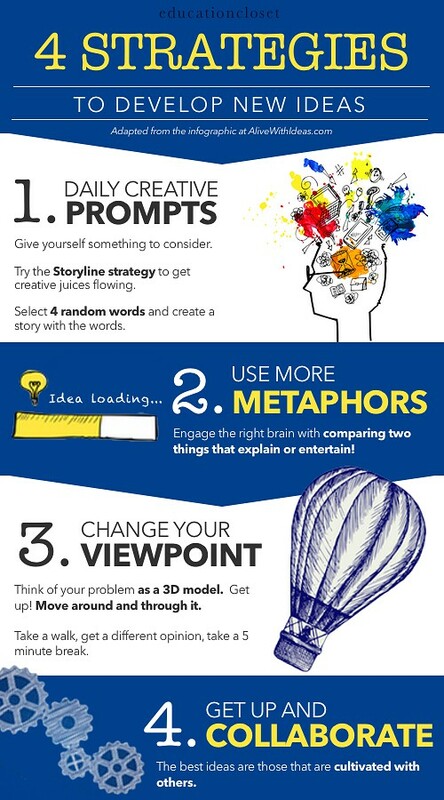 Whenever this happens to me, I turn to 4 tried-and-true ways to kickstart my creative ideas process (thanks to AliveWithIdeas for the inspiration!). These four strategies not only help me, they have also helped my students. Whenever I hear the “but I can’t think of anything else!” phrase, I point them back to this as a reference and ask them to try again. Without fail, they always come up with something new. Don’t let the pressure to innovate keep you stuck! Be kind to yourself – take a break and let your mind percolate – you’ll come up with a brilliant idea soon enough.